When Juno successfully entered orbit around Jupiter on 4th July 2016, it was placed an orbit that took 53.5 Earth days to complete. 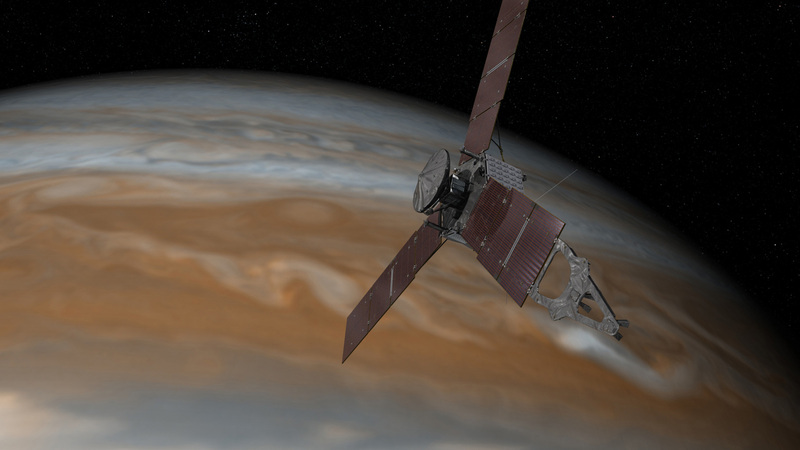 During the 3rd orbit, which was scheduled to begin on 19th October 2016, a burn of the main engine was intended to move Juno into a 14 day science orbit. This new orbit was going to allow the instruments onboard Juno to get a closer look at Jupiter and collect exciting new data. However, during testing of the spacecraft’s propulsion system, which took place before the 3rd orbit began, the Juno team discovered a problem. The helium check values did not perform as they were expected to, opening for several minutes rather than seconds. As the Juno team did not know the cause of this problem it was safer to leave Juno in the longer orbit than risk a burn of the main engine as this may jeopardise the whole mission! The Juno team are still assessing the problem with the propulsion system and will postpone the burn to reduce the orbit from 53.5 days to 14 days until the problem has been identified and solved. Furthermore, during the 3rd orbit, just 13 hours before Juno’s closest approach to Jupiter, Juno went into safe mode. This is triggered automatically by the spacecraft itself and causing all of the instruments to be switched off. It is thought that a software performance monitor induced a reboot of the spacecraft’s onboard computer, however the Juno team are still investigating this to figure out exactly what triggered safe mode. These two problems are completely unrelated – Juno hasn’t been so lucky! Although this all sounds quite negative the important thing to remember is the spacecraft is most definitely still working. The Juno team are right to be cautious about performing the engine burn, there’s no point in taking unnecessary risks, especially when Juno can still take measurements in the 53.5 day orbit. The spacecraft entered safe mode as a precaution and rebooted just as it was meant to, ensuring future success for the mission. By staying in this longer orbit for an extended period of time, Juno will be further away from Jupiter, therefore spending less time in the extreme radiation environment of Jupiter’s magnetic field. This will actually extend the life-time of the mission since the instruments will spend less time being exposed to the harsh radiation. The mission can still achieve all of its scientific goals, but we just have to be more patient before we get the final answers.